Idiotic female + cold, unfeeling killer who shouldn't be let anywhere near polite society = bad book? When it comes to how I see things, this would normally be how I'd feel. My patience for idiocy is practically non-existent these days. 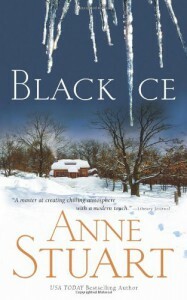 I really shouldn't have liked Black Ice, but I did. The setting was different, the secret society/spy vibe was interesting, and Bastien amused me, in all of his twisted, detached glory. Chloe should have been shot in the head multiple times, but oh well. I rarely get what I want. I had lots of awesome quotes to put in this space, but it's the weekend, I have places to go, and I can't be bothered to make the time.